the project in manageable increments. Sign up now and get insights into the POST case! The Nexterday North antiseminar will hit Helsinki on 28 - 29 November 2016. Join us as we give you 10 excellent reasons to join this antiseminar - and a chance to ask questions. In this second webinar in a series of ‘Winning with Fibre’ by Comptel, you will learn about a great real life business case of Chorus, a CSP in New Zealand. They entered the fibre wholesale market successfully with a modernized service delivery architecture. Since service launch, Chorus have gained tangible business benefits thanks to the intelligent fulfillment and inventory solution built around Comptel’s FlowOne Fulfillment and GE Smallword software. Sign up now to get a broader view on broadband! As a response to the never-ending bandwidth demand, CSPs are constantly enhancing their networks. Fiber brings superior transport capacity and quality compared to the other broadband media and has therefore become commonplace for CSPs. This is the first in a series of ‘Winning with Fibre’ webinars. Get a comprehensive outlook on the fibre market and learn how it builds a perfect business opportunity for CSPs. You will gain multiple viewpoints of and hands-on experiences on the topic in the course of the series. Sign up now to get a broad view on broadband! This interview with Comptel CTO, Intelligent Data Mikko Jarva, gives you tools and ideas on how to turn unused data into actions and revenue, and create magic for your customer. Currently only one in five CSPs can utilise their customer data. Comptel can help you to generate revenue from the data. CSPs have large amounts of data in silo orientation which relates to inventory from the network, services, logical resources and IT systems. It leads to an unmanageable mixture of legacy, spread sheets, unstructured databases and in-house “quick fix” applications. The obvious solution is to assume and expect all inventories to be managed by one inventory platform, but this has typically lead to projects with unmanageable scope, rarely achieved successfully anywhere in the world. In the midst of virtualisation and its associated efficiency drive, inventory federation has manifested itself as the new holy grail. Join the conversation. This is the last webinar in a series of four. The commoditisation of the network is revolutionising the business models of CSPs, Enterprises, network and IT vendors. The operational frameworks of the past are being disrupted and there are plenty of new kids on the block. Operationalising NFV isn’t just about deploying virtualised network functions its about the complete lifecycle management, automation and delivery of agile services to customers – but there is plenty to consider, no less is the ultimate goal – monetisation and the link to the sales process. Join the conversation. This is the third webinar in a series of four. 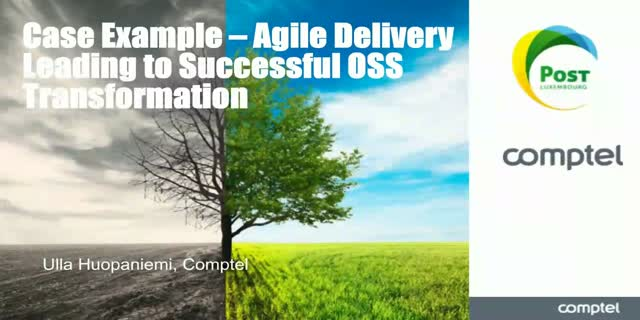 Faced with the impending adoption of cloud and virtualisation in the OSS, BSS and the network, some CSPs have already begun their journey to transform how they do business more efficiently. It’s a journey of discovery where the assets of traditional offerings have to roll into the new virtual world, especially for sales transformation. The business can’t afford to take a break while the IT department sorts itself out. The webinar will highlight how one incumbent operator has taken on the challenge and offer some food for thought. Join the conversation. This is the second webinar in a series of four. The requirements and dynamics of the cloud generation customers are piling up, and therefore managing the complexity and the speed of data bundles is increasingly important. Join us to hear how Comptel's Monetizer solution with Policy Charging Offer Designer (CPOD/PCC5) can satisfy the demands of digital natives. The webinar takes about 45 minutes. The digital buying experience has transformed the way that customers are guided, research, select and are delivered the products they need. This already applies to the consumer but the same expectations are starting to apply to the Enterprise as the market adopts a business-to-human (B2H) approach. As cloud becomes more widely adopted it’s important for CSPs to make the most of its recognised efficiencies and agility. Service Orchestration has to become increasingly automated and transparent. Join the conversation. This is the first in a series of four webinars. This 45 minute webinar describes how to create intelligent fast data: how to refine data streams into relevant, revenue generating, cost saving and value adding actions easily by utilizing capabilities of Comptel's Data Fastermind, Data Refinery and Monetizer solutions. Key topics covered in this webinar include: real-time action and marketing automation, embedded contextual intelligence, predictive analytics, simulation and real-time decision orchestrations. This 45 minute webinar highlights Comptel's Data Refinery solution with practical examples how to derive value out of data. Data Refinery is based on the world-class Comptel EventLink platform. It adds intelligence to data handling, and enables real-time analysis, decisions and actions based on the data going through the system streams. It addresses traditional data integration challenges with proven ability to process billions of events and transactions. It masters complex event processing, derives value out of correlated and enriched events and performs real-time analysis with decisions and actions to enable automated campaigning processes, for example. Join the webcast to hear how to predict and prevent network failures before they occur and cause costly unplanned site visits and bad customer experience. Comptel´s Critical Alarm Prediction solution combines Big Data from network elements to machine learning based analytics to provide actionable foresight on which network elements are likely to fail next. Life is about digital moments. Comptel perfects these by transforming how Communications Service Providers and Digital Innovators serve, meet and respond to the needs of “Generation Cloud” customers. Join our webcasts to be inspired by the leading thoughts and stories which will inspire you to innovate rich communications services instantly, master the orchestration of service and order flows, capture data-in-motion and refine decision-making. We apply intelligence to reduce friction in your business. For more information, visit www.comptel.com.